We are seeing more and more tools improved with the addition of technology that makes them smart. 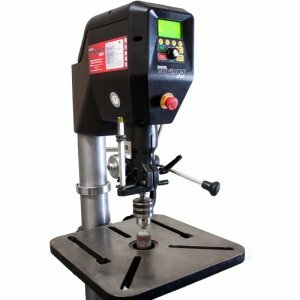 Nova is bringing the improvements that come along with the Smart Motor technology from DVR Technology Developments, Inc. to their Voyager 18" Drill Press (NOVA-58000T). The Nova Voyager Drill Press says bye bye to belts or pulleys and instead uses a DVR (Digital Variable Reluctance) Smart Motor that is both brushless and direct drive. It has a variable speed range of 50 to 5500 RPM, and still all the torque you need to drill steel. The motor can be set up for either 115V or 220V and can turn on or off with no power spike. The Nova Voyager is not only smart because of the digitally controlled motor, its onboard computer takes all the guess work out of the drilling speed requirements for different materials. An LCD screen allows the user to use a simple picture menu to select the drill bit size and the material they want to drill, and the computer will figure out the optimum cut speed. If that isn't enough, the computer can be used to zero out the drill bit height so the user can use the display to see exactly how deep they are drilling. Taking things to the next level of coolness, the user can also input their maximum depth and have the drill automatically stop when the cutting depth is reached. The drill depth can be dialed into an accuracy of 0.05” increments. Other features include a pilot-hole setting, favorites options, auto braking, auto start on handle pull, and more. There are even safety features built in to stop the drill if a piece comes loose. The Nova Voyager DVR 18” Drill Press isn't exactly cheap, but at $1499.99 it is cheaper than I expected. I was thinking it would cost two grand or more. Check out the video below to see it in action. 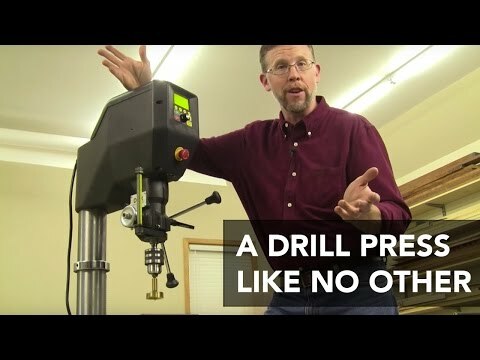 What speed should you set your drill press for each bit? NOVA's new variable-speed, computerized Voyager DVR Drill Press sets the speed for you. Chris Marshall demonstrates it's three state-of-the art features. This drill press features no belts or pulleys - instead, it uses a DVR (Digital Variable Reluctance) motor.